Ther. Monday, Feb. 6, 1888 Wea. As cold, with snow falling most of day & quite blustering. 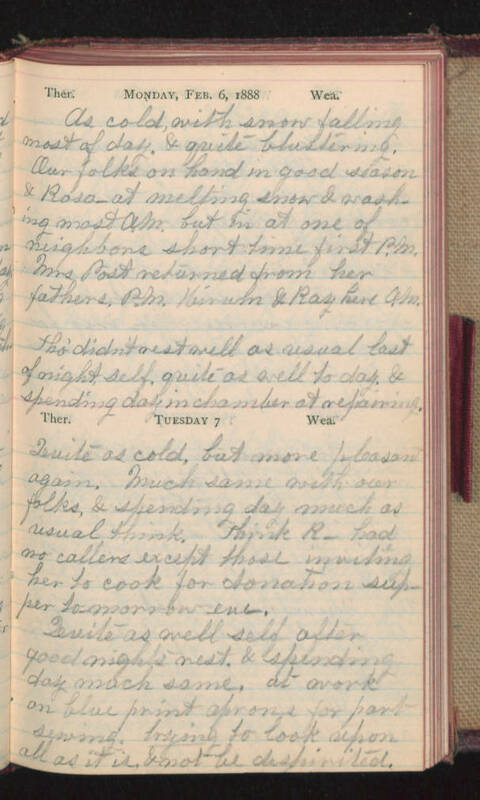 Our folks on hand in good season & Rosa at melting snow & washing most A.M. but in at one of neighbors short time first P.M. Mrs. Post returned from her fathers, P.M. Hirum & Ray here A.M. Tho' didn't rest well as usual last of night, self, quite as well to-day, & spending day in chamber at repairing. Ther. Tuesday 7 Wea. Quite as cold, but more pleasant again. Much same with our folks, & spending day much as usual think. Think R_ had no callers except those inviting her to cook for donation supper tomorrow eve. Quite as well self after good night's rest & spending day much same, at work on blue print aprons for part sewing. Trying to look upon all as it is, & not be dispirited.